GFA's Bella Litt, right, a resident of Darien, defends an opponent. The spring season got under way last week with some dodged weather, some big wins and some tough losses for the Greens Farms Academy Dragons. This week, all our spring sports kick into high gear with games around the region. 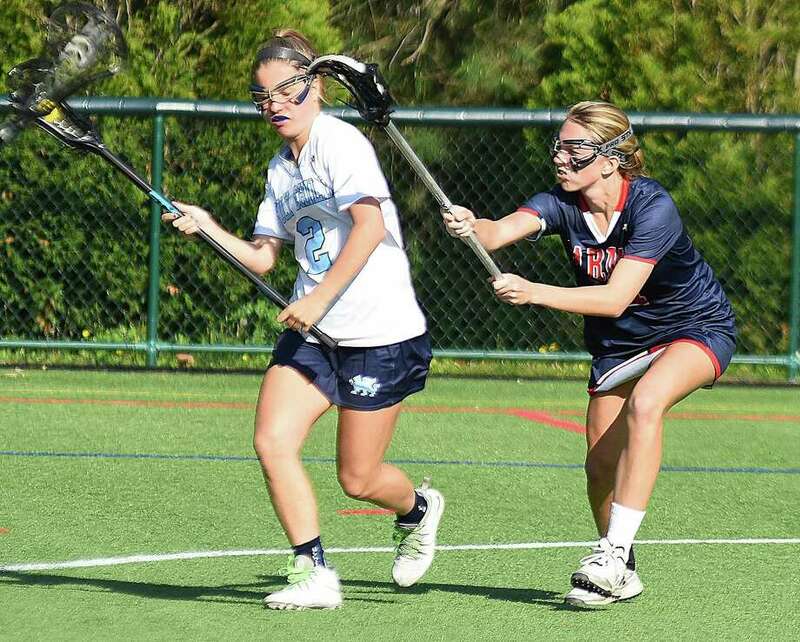 Bella Litt (Darien) and Ella Murphy (Darien) combined for 11 goals as the GFA girls lacrosse team rolled to an 18-7 win over The Harvey School in Thursday’s season-opener. Sarah Logan (Darien) dished out four assists on the day while Isabelle Jackson (Greenwich) and Alex Nesi (Fairfield) both chipped in with two goals each. Freshmen Paige Benson (Darien) scored twice and Annie Lew (Southport) scored the first goals of their varsity careers, too. Lew also had an assist as did Litt and Murphy. Goalies Kelly van Hoesen (Greenwich) had six saves and Kaitlin Reed (Southport) had five saves as they split duties in the cage for the GFA. Drew Durkin (Darien) led the Dragons offense in the opener while Mark Roszkowski (Westport) led it in the second game. The GFA golf team opened its 2018 season on Thursday with a 5.5-3.5 loss to Rye Country Day on the road. In head-to-head points, GFA led by a 3.5-2.5 count, but Rye’s team total of 220 (to 226 for the Dragons) earned them two points, tying the match. The Wildcats also won medalist honors for an extra point. Will Lodge (Darien) and Piero Panariello (Westport) led the way for GFA with 42s. Giani Panariello (Westport) added a 44 with Ian Epps (Darien) shooting a 46, Ryan Ventura (Weston) a 52 and Teddy Brown (Greenwich) a 61. Charlie Benson (Darien) and Zach Liston (Wilton) scored four goals each and Ryan Pilkinton (Weston) made four saves as Greens Farms Academy posted its first win of the season with an 11-2 victory over Kingswood-Oxford on Saturday in West Hartford. Liam Murphy (Westport) added two goals while Kyle Haas (Darien) also scored. Benson had two assists while Liston, Thomas Edwards (Darien), Adler Viton (Greenwich) and Max Yates (Fairfield) also notched assists. The Chris Doctor Era of the GFA boys lacrosse program opened on Wednesday with a tough road battle at Wilbraham and Monson Academy, with the Dragons falling by a 10-7 count earlier in the week. Benson scored three goals to lead the GFA offense while Liston had one tally along with three assists. Murphy, Will Magrone (Darien) and Connor Zaminski (Greenwich) added single goals for the Dragons. GFA won nine face-offs, dropping seven. The Dragons gave up seven unearned runs, costing them a victory, but battled tough and pounded out 13 hits in a season-opening loss to Sacred Heart-Greenwich. Janise Park (Bridgeport) earned game ball honors, leading the Dragons with two hits and a couple of sharp defensive plays at first base. Celeste Matte (Stratford) had three hits and led the offense for GFA as she scored two runs and plated two more. Lucy Nelson (Westport) added two hits and three RBIs while also scoring twice. Maddy Canning (New Canaan), who struck out 11 in the game, added two hits, as well. Leah Attai (Bridgeport) and Jess Cramer (Wilton) had hits as did Rari Bellingeri (Stamford) and Piper Dove (Norwalk). For the latter two hitters, it was their first-ever varsity game and hits.